Damn, September has been a busy month. I took a trip up to the mountains on Labor Day and went out to Los Angeles for work...not to mention the Jewish holidays, a weekend with my in-laws, a weekend flying as solo dad, etc. Somewhere in there was the Austin GDC! The Austin Game Developer's conference is my favorite professional event of the year. It is relatively small (about 3,000 attendees), hardly covered by the "enthusiast" press, has a game writing session track, and takes place in Austin (duh), a very cool town with plenty of B's: beer, bars, bats, babes, barbecue, bands, bike cabs, you name it. 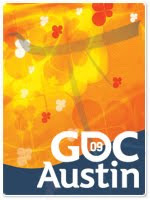 Last year I put "write up Austin GDC notes" on my to-do list, and I never to-done it. (It might have something to do with the fact that we launched our game only a few months later.) There was a lot of cool stuff that I remember; in particular, a lecture by Cryptic's Jack Emmert and a keynote from the Club Penguin dude. But, alas, that was 2008. This year, I was determined to get some of the best bits from the conference down in some form…not just for my own benefit, but to share with my colleagues as well. So here is a smorgasbord of random notes, statistics and miscellany from a few of the sessions that I attended. I believe that the conference's organizers will make all of the sessions available on their website eventually. If you ever check it out, make sure to listen to Reaching A New Demographic: Kids AND Their Parents. There were some real geniuses on that panel, particularly the guy that made (totally appropriate) child molester jokes about conducting audience research in his rusty white van. Smedley's presentation was (not surprisingly) devoted almost entirely to Free Realms. But he began with some general statistics: the MMO audience has an average age of 33, with a gender split that is 85% male, 15% female. Free Realms is 60-70% male, 30-40% female, depending on the demo. Their player base breakdown by age is 51% is under 13, 29% is 13-17 and 20% is 18+. (It is interesting to note that our breakdown is almost the same.) The top Free Realms jobs are: brawler, derby driver, race driver, chef and pet trainer. However, there are more level 20 card duelists than any other job. (I think level 20 is the current max?) TCG card packs are also the #1 cash item sold in their shop. Regarding the shop, Smedley mentioned Nexon's Combat Arms as an interesting game to study in terms of monetization. A telling stat: though 60% of the player base is boys, 60% of the cash item purchasers are girls. Smedley also noted that despite all the talk of viral marketing and social marketing, TV is still the big driver. He claims 75% of Free Realms traffic is driven by TV, and though their traffic peaks at around 5:30 PM (PST? ), the game spikes whenever an ad runs. Obviously, the duo went into more detail on each point. Their thoughtful and straightforward presentation was very enlightening. Though many of their conclusions can be reached intuitively by a smart person, their combined experience and knowledge lent greater clarity to the information. One of the best sessions that I attended. First off, I cannot believe that these guys missed the opportunity to call their keynote "The World…of World of Warcraft" -- but it was otherwise an extremely interesting peek behind the curtain at Blizzard. The combined human and non-human resources that are required to run everyone's favorite MMO behemoth are staggering. Instead of tabulating all the statistics, you can find a nice overview of the presentation on Gamasutra. From my perspective, one of the most interesting things to note is that of the 4,600+ employees devoted to WoW, more than half (upwards of 2,500 people!) are in customer service. This reinforces the belief that I have been hearing time and time again: when you launch an MMO, you are not launching a game. You are launching a service. And launch day is just the beginning. The conference's final keynote was out of left field for me, and a real eye-opener. Playfish is a company that DIDN'T EVEN EXIST two years ago, and now they have some of the most popular games available on social networks. This just tells you how fast content is moving and evolving in this space. To wit: Playfish has made ten titles to date, which have attracted about 50 MILLION players in 20 months. Even if these players are not technically "active" players, the numbers are still astounding. There are a handful of forces working in Playfish's favor, and de Halleux was more than happy to point some of them out. First of all, Playfish games are enjoyed by "non-gamers" -- men and women aged 16-34 who would not classify themselves as "gamers" and probably don't even own a game console. They don't think of games on say, Facebook, as games…they just consider them fun. Another important factor for Playfish is their international base: a nearly perfect one-third/one-third/one-third split between the Americas, Europe and Asia. Oh, and don't forget: Playfish has not done any marketing at all, relying completely on their player base to seed their content. In many ways, this is the most amazing thing of all, and the factor that really changes the landscape for how games are sold, distrubuted, marketed, and so forth. Moving on, de Halleux dipped into the "softer" side of making games, how they generate emotions, social connections, etc. Playfish games, he explained, become "objects of social interaction" instead of just gameplay experiences. He went on to explain some of inherent design philosophies at his company, along with some more technical information regarding the way the business is run. On the whole, they have 200 employees globally, with four offices (and one on the way in San Francisco). Oh, and they are profitable. And based on the smile on the dude's face, I would suspect that they are very profitable. Well, there you have it. I met many great people (as always), saw some old friends and learned a lot more than what I documented above. Even though the Congress Avenue Bridge bats refused to make an appearance (again! ), I had an awesome time. That is some good stuff. Thanks for the recap. The social-network-seeding as a distribution method is particularity interesting to me as someone that is occasionally promoting music on the net. It's crazy. They have spent zero dollars marketing their stuff.